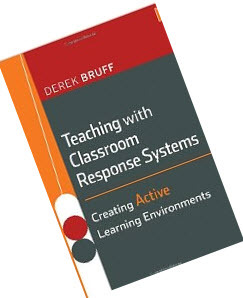 Are you struggling to offer active and experiential learning to large numbers of students? SimMan could save the day. SimMan is a high-fidelity patient simulator who can be programmed to display a wide range of physiological and pathophysiological signs and respond appropriately to treatment, be it physical, e.g. cardiopulmonary resuscitation, or therapeutic, e.g. administration of drugs. But surely only a few students can make use of SimMan at a time? 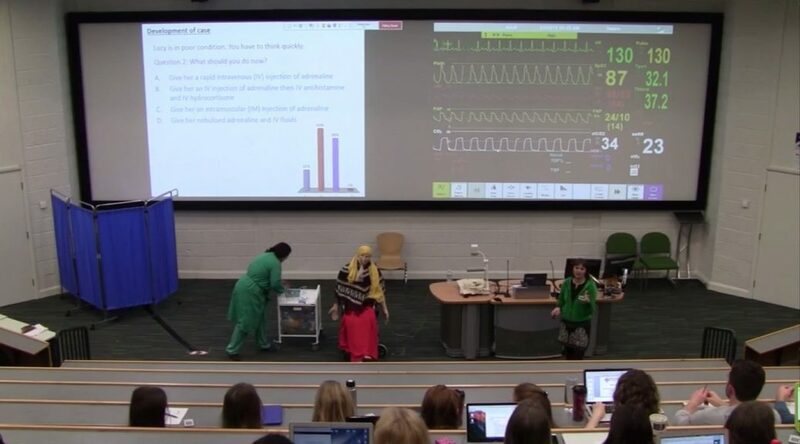 Clare Guilding (Lecturer in the School of Medical Education) has developed an effective way of using SimMan along with interactive voting technology to provide an engaging learning experience for a lecture theatre full of students. One of the screens projects the physiological readouts from SimMan such as his blood pressure, ECG heart trace and oxygen saturation; the other screen is linked to a TurningPoint interactive quiz. Each student is supplied with a TurningPoint handset and at a series of key clinical points throughout the scenario, the students are asked to vote individually and anonymously on the most appropriate course of action (e.g. initial patient management steps, which drug should be administered etc.). The option with the most votes, (whether or not this was the correct) is applied to SimMan and the students then observe the physiological effects this has in real time. One commented that ‘the lecture using SimMan at the end was really good, especially using TurningPoint so that we could try to ‘treat’ SimMan. It kept the lecture clinically-focussed and enabled us to see how the information would come in useful in practice’. To find out more about SimMan and read about medical students’ repeated attempts to save his life, read the full case study on the Case Study database. Or if you have your own example of really effective teaching practice in your School do get in touch with ltds@ncl.ac.uk. The blog pages include posts with examples categorised by use (eg team-based Learning or peer assessment) and question type (eg conceptual or case study questions). Both are well worth a look if you are want more ideas on how and why you might use voting systems.THe blog also considers Backchannels (text, Twitter etc) and visual learning. Marina Sawdon, a lecturer in Medical Education at Durham University asks voting system questions as part of the lecture each week. Some of those questions address topics covered in previous weeks, not just the topic covered that day. She is able to use this to demonstrate to students that they are retaining knowledge. In fact, the number of correct answers goes up when she re0tests students on earlier learning. Marina badges this as an additional form of feedback to students and she has had very positve reactions from her students to these interventions. See http://onlinelibrary.wiley.com/doi/10.1111/j.1365-2923.2009.03332.x/full for a full article on her work in this area.